By Dwight Chittenden: #4 WBC Josesito Lopez (30-4, 18 KO’s) says he feels stronger now that he’s moved up from 140 pounds to fight. In his last fight, the 28-year-old Lopez moved up to 147 lbs and defeated former WBC welterweight champion Victor Ortiz after breaking his jaw in two places last June in a back and forth fight. Lopez, 5’11”, now will be moving up to 154 lbs to take on WBC junior middleweight champion Saul Alvarez (40-0-1, 29 KO’s) at the MGM Grand, in Las Vegas, Nevada. It did look like Lopez took some rounds off in the Ortiz fight. I thought Lopez. He says he didn’t, but I thought Lopez fought hard in spurts and rested in some rounds. Regardless of how strong Lopez says he’s feeling for the Alvarez fight it’s still going to be awfully difficult for him to compete in this fight. He looks kind of frail and doesn’t possess the same kind of thudding power that the 22-year-old Alvarez possesses. Before Lopez’s fight with Ortiz, he’d never really done a whole lot. He was beaten by a limited fighter in Jessie Vargas last year in September. You can say it was a controversial loss, but Lopez still struggled against a limited fighter. 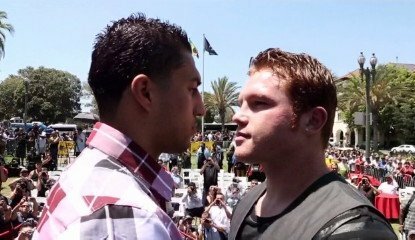 Alvarez would likely eat Vargas up for dinner if they were to fight, and I can’t see Vargas escaping that fight on his feet. Lopez probably lucked out in the Ortiz fight when Ortiz suffered the jaw injury. Lopez was behind in the fight and on his way to losing. Lopez won some rounds that he probably wouldn’t have after Ortiz suffered the jaw injury. Had the injury not occurred, Lopez likely would have lost by at least four rounds, if not more. In a bizarre note, the World Boxing Council has already given Lopez a #4 ranking in the junior middleweight division despite the fact that he’s never faced anyone at that weight. I guess it makes Alvarez look a little better fighting a guy ranked in the top #4 at 154 then someone that just recently fought for the first time at 147 in his last fight. Previous boxing news: Ward vs. Dawson: Just the Facts!